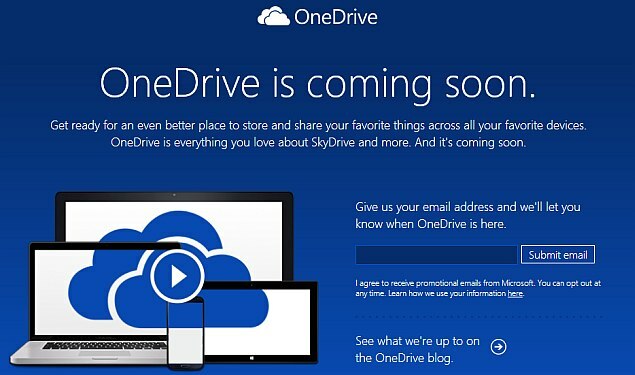 Microsoft is going to rename its cloud storage service ‘SkyDrive’ as ‘OneDrive’ after British broadcaster BSkyB took issue with its name. The dispute however was settled last year in the month of July for undisclosed financial terms after the case was won by British Sky Broadcasting Group PLC in a British court. Although the date isn’t yet announced but as per Microsoft they will soon be making the change. The logo of this cloud storage service by Microsoft however will remain the same i.e. two blue clouds on a white background. Last July, Microsoft re-organized its corporate structure to focus on providing both devices and services in a strategy it called ‘One Microsoft’.